Lots of people still aren't sure what to make of the deluge of "smart" speakers that have hit the market in recent years. Perhaps you've even thought about buying one, but decided to hold out until someone engineered one that's capable of pouring you a stiff drink on command. 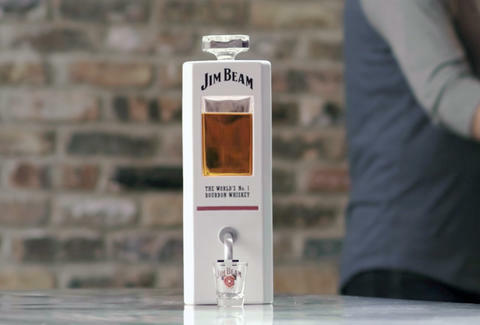 Well, if that's you, your wait is over, because the crack team at Jim Beam figured it out, and have unveiled a device that will pour you a shot of bourbon whenever you ask it to. The device, which the company has aptly named "JIM" doesn't behave quite like Amazon's Alexa or Google's Home Assistant. It won't tell you the weather, traffic or news, and won't order you an Uber when you ask. In fact, it doesn't perform any functions other than doling out a shot of Jim Beam -- via its built-in spout -- when asked. Say what you will of this marketing stunt, but JIM may prove to be the most urgent gadget of the year, and the only one that will actually help get you through these trying times. To set JIM up, you plug it in, pour in a bottle of your favorite hooch (they of course recommend Jim Beam, but it's unlikely the machine is sophisticated enough to detect something else if you so choose), and it's ready to start pouring. To activate it you say "Hey Jim" followed by a command like "pour me a drink" or "pour me a shot" and it'll oblige (hot tip: make sure you have a glass under the spout first). It's equipped to respond to certain other drinking-related commands like "Hey Jim, let's toast" or "Hey Jim, what's the best way to drink bourbon?" but ask it any other question and you're most likely to get some variation of "I have no idea" followed by a recommendation to start drinking. JIM also has the sort of raspy tone and jovial timbre you'd want from a disembodied voice serving you booze -- that's because it's actually Fred Noe's, the seventh generation master distiller of Jim Beam. You can get one right now while supplies last for just $34.90 at JimBeam.com, but until then, you'll just have to pour your own damn bourbon.